Exciting news today! Tomorrow marks the beginning of the Pan Am Torch Relay, a Canada-wide public event that will see more than 3,000 torch-bearers carry the Pan Am flame through 130 communities across Canada. The torch began its journey earlier this week in Teotihuacan (pronounced te-aw-tee-wah-kahn), Mexico, at the Pyramid of the Sun — the third-largest ancient pyramid in the world, built more than 1,900 years ago. In the lighting ceremony, a descendant of the ancient Aztecs passes the flame to a representative from the particular year’s host country — Canada in 2015! That Canadian representative then became responsible for transporting the flaming cauldron here — by plane! The torch will land in Toronto for an arrival ceremony (tomorrow) before heading off to other cities and towns throughout Canada — up to nine a day! From Richmond, British Columbia, to Halifax, Nova Scotia, the torch will pass from person to person, sometimes with the help of cars, planes and even horses, before coming back to rest in Toronto on July 10, 2015 — just in time for the Opening Ceremony of the Pan Am Games. The total journey is more than 20,000 km long. 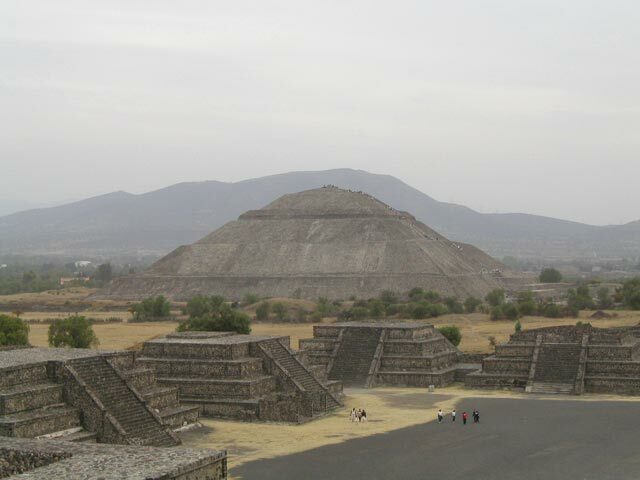 The Pyramid of the Sun. Image Source. Have you ever wondered what it actually takes to get the flame across oceans or large land masses by air? In the case of Olympic torches, which have to travel similarly long distances, enclosed lanterns lit from the same source as the torch are used on aircraft to keep the flame alive until the torch can be relit on the soil of the host country. Porter, Toronto’s own airline company, serves as the Pan Am/Parapan Am Games’ official air carrier and will be flying the torch from Toronto to Thunder Bay to kick off the relay at the Terry Fox Memorial. Fascinating stuff! Want to see the passing of the torch in person? Visit the Toronto 2015 website to find out when the torch will be visiting your community. The Pan Am flame shares its origin with its Olympic cousin, symbolizing the theft of fire from the Greek god Zeus by Prometheus, who subsequently gifted fire to humankind and started us on the path to civilization. In fact, before the tradition was begun of lighting the Pan Am flame in an Aztec ceremony performed by modern-day descendants in still existing ancient temples, the fire was originally lit in Olympia, Greece! “Our games are an agent of change, of transformation. We’re creating more than buildings and venues. Our purpose is to create a legacy — of healthy, active people, especially kids . . . of the values we learn through sport; of strong communities . . . all inspired by something extraordinary — the energy and passion of joie de vie, alegria, joy. The TORONTO 2015 Pan Am/Parapan Am Torch depicting athletes in motion in the spirit of the motto of the Games, “United We Play”. The torch is capable of withstanding winds of up to 70 km/h. Image source. Several torch-bearers have already been announced, including the Toronto resident Zsofia Balazs. Balazs, whose name you might recognize, is a Hungarian-born Canadian distance swimmer. Currently working as a police officer with the Toronto Police Service, she was a silver medal finalist in the 2007 Pan Am Games, as well as an Olympian in the 2012 London Olympics. When she was announced as a torch-bearer, Balazs commented that the torch relay really brought the community together and that “I feel great. It’s a huge honour”. Two other famous torch-bearer this year are the retired Canadian astronaut Chris Hadfield and the Canadian triathlon champion Simon Whitfield, a two-time Olympian medalist and bronze-medal winner in the 1999 Pan Am Games.